On the second day of Christmas, my true love gave to me....Chocolate Bacon Bites, Bacon Fudge and a Chocolate Covered Bacon Strip! 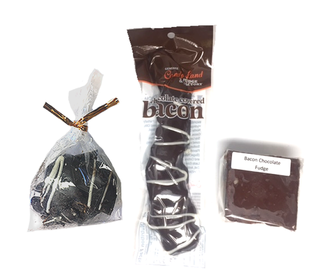 Our Genesee Bacon Chocolate Sampler includes all THREE of these delightful and delicious treats! SPECIAL OFFER: Genesee Bacon Chocolate Sampler (3pc Set) is on sale now...plus FREE shipping! 12 DAYS OF CHRISTMAS! From Dec 1 - 12th, we will be sending out daily special offers on our most popular Bacon products! Special is valid for a limited time only, and only while supplies last! Check Bacon Addicts daily for new offers! !